Baby boomer and multiple Academy, Emmy & Tony Award nominated actor, producer, writer and director Ed Harris was born November 28, 1950 in Englewood, New Jersey. Ed Harris broke into television in the late 1970's with small roles in popular baby boomer television series such as Delvecchio, The Rockford Files, Barnaby Jones. Another small part in the movie Coma (1978) starring Michael Douglas, Rip Torn, Geneviève Bujold, Tom Selleck (Magnum, P.I. ), and Lois Chiles, was the movie debut for Ed Harris. Harris had a role in the 2-part TV mini-series The Seekers (1979) featuring Barbara Rush (Peyton Place) Brian Keith, Randolph Mantooth, Delta Burke, George Hamilton, Hugh O’Brian, Stuart Whitman, and Eric Stoltz. In 1983, Ed Harris appeared in the thriller Under Fire (1983) co-starring Nick Nolte, Gene Hackman, Jean-Louis Trintignant, Joanna Cassidy, and Richard Masur. Jacknife (1989) co-starring Robert De Niro and Kathy Baker. The Abyss (1989), his first leading man role, opposite Mary Elizabeth Mastrantonio. Also in The Abyss with Ed Harris were Michael Biehn and veteran character actor J. Kenneth Campbell. Astronaut John Glenn in the movie The Right Stuff (1983), co-starring Sam Shepard, Scott Glenn, Dennis Quaid, Fred Ward, Barbara Hershey, Charles Frank, and Pamela Reed. Below, a movie clip from The Right Stuff features Ed Harris, Mary Jo Deschanel as his wife. Ed Harris had co-starred opposite stellar leading ladies Jessica Lange in Sweet Dreams (1985) and Sally Field in Places in the Heart (1984). Places in the Heart also had actress Amy Madigan in the cast, along with John Malkovich, Danny Glover, and Terry O'Quinn. Harris had a new leading lady in his private life as well by that time. While working on a play in Los Angeles in the early 1980's, Ed Harris had met fellow actress Amy Madigan; they played lovers in Places in the Heart, which filmed in Waxahachie, Texas - and got married there on November 21, 1983. Daughter Lily Harris was born May, 1993. Amy Madigan and Ed Harris are still together and have just celebrated their 32nd wedding anniversary - a rare, long-lasting "Hollywood" marriage. The couple have made their home in Malibu, California for many years. Below, real-life lovers Amy Madigan and Ed Harris are featured in the Sony movie trailer for Places in the Heart. Glengarry Glen Ross (1992) with Al Pacino, Jack Lemmon, Alec Baldwin, Alan Arkin, Kevin Spacey, and Jonathan Pryce. Nixon (1995) with Anthony Hopkins, Joan Allen, Powers Boothe, Paul Sorvino, Mary Steenburgen, and James Woods. Just Cause (1995) with Sean Connery, Laurence Fishburne, Kate Capshaw, and Ned Beatty. Ed Harris received an Oscar nominations for his work in Ron Howard's Apollo 13 (1995). His Apollo 13 co-stars included starring Tom Hanks, Kevin Bacon, Gary Sinise, Kathleen Quinlan, and Bill Paxton. A few years later, Ed Harris received another Academy Award nomination for his performance in The Truman Show (1998). Below, Jim Carrey, Ed Harris, Noah Emmerich, Laura Linney, and Paul Giamatti are featured in a clip from The Truman Show. In addition to starring in the made-for-television movie Riders of the Purple Sage (1996) as Jim Lassiter, based on the Zane Grey western Riders of the Purple Sage, Harris also served as executive producer on the film. Wife Amy Madigan co-starred in Riders of the Purple Sage as his love interest, Jane Withersteen. Below, the Warner preview clip for Riders of the Purple Sage features Ed Harris and Amy Madigan. Turning the corner into his 50+ years, Ed Harris took on the new challenge of executive producing and directing for a movie about painter Jackson Pollock. Pollock (2000), which he also starred in, garnered Harris a third Oscar nomination, this time for Best Actor. Once again, his wife Amy Madigan was in the cast of Pollock, along with Sada Thompson, Marcia Gay Harden, and John Heard. Above, Ed Harris as Jackson Pollock in Pollock. Harris' creative energy showed no signs of slowing down with maturity - during his fifties, he appeared in another 18 movies including A Beautiful Mind (2001) starring Russell Crowe, Jennifer Connelly, and Christopher Plummer; The Hours (2002) starring Nicole Kidman, Julianne Moore, and Meryl Streep. He earned his fourth Academy Award nomination, for Best Supporting Actor in The Hours. After a 9-year break from television, Ed Harris co-starred in the star-studded miniseries Empire Falls (2005). The cast of Empire Falls included Robin Wright, Aidan Quinn, Joanne Woodward, Dennis Farina, William Fichtner, Theresa Russell, Jeffrey DeMunn, Helen Hunt, Paul Newman, and Larry Pine. A History of Violence (2005) saw Ed Harris in a cast that included Viggo Mortensen, Maria Bello, and William Hurt. 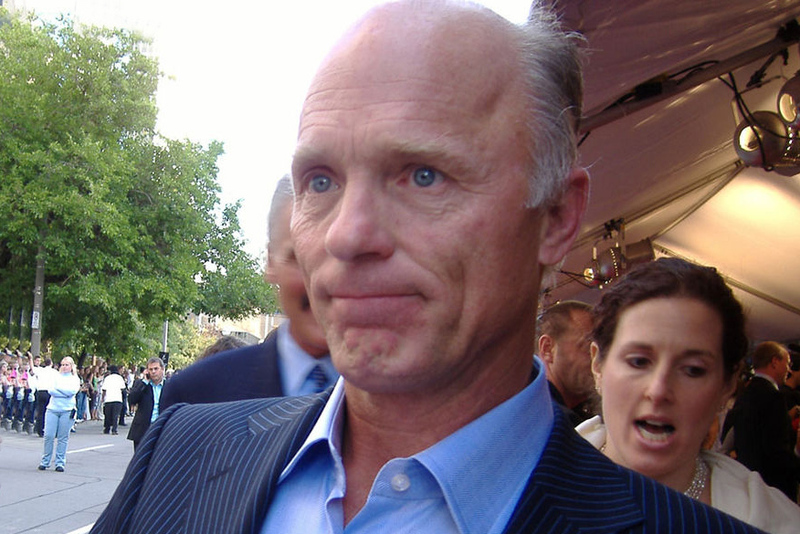 Ed Harris wrote, directed, produced, and starred in Appaloosa (2008), which also won critical acclaim. Appaloosa re-teamed him onscreen with his A History of Violence star, Viggo Mortensen, and Jeremy Irons. Below, the movie trailer for Appaloosa features Ed Harris, Viggo Mortensen, Jeremy Irons, and Renee Zellweger. Closing in on his senior years, at age 62 Ed Harris won a Golden Globe Best Supporting Actor Award for his role in the HBO TV movie Game Change (2012). Julianne Moore, his co-star from The Hours, appeared in Game Change, along with Woody Harrelson, Peter MacNicol, Jamey Sheridan, Ron Livingston, and Sarah Paulson. Throughout his career, Ed Harris' trademark intensity, unabashed and early-onset balding, and piercing blue eyes contributed to the feeling of honesty and realism that inhabited the characters he played, making him a perennial favourite with baby boomers and other generations. Ed Harris has appeared periodically in off-Broadway plays and now as a new senior citizen, in 2016 he will be appearing in an off-Broadway Sam Shepard play Buried Child, opposite his wife Amy Madigan. His creative output is picking up steam as he gets older - between 2010-2015 he has 17 movies under his belt, and more on the way - In Dubious Battle with Robert Duvall and his The Right Stuff co-star and Buried Child playwright Sam Shepard; as well as two other movies are set to be released in 2016 and 2017. "I like to stay in shape: I swim, play tennis, and shoot a few baskets with other actors." Happy 65th Birthday, Ed Harris!